“My Run” The Movie | Todayz Run!!! ← Toe’s Up!! It’s a injinji Sock Review and Giveaway!!! To what lengths would you go to make a point, to help others, to get a community’s attention, or to “Be Somebody’s hero”? Would you run a marathon? Would you run 10 marathons? Would you run 75 marathons? How about 75 marathons in 75 consecutive days?!! Well I don’t know if you have heard about Terry Hitchcock, the man who did just that after loosing his wife to cancer, and who was left to raise his three young kids as a single parent!! The award-winning and critically acclaimed documentary MY RUN is coming to movie theaters nationwide for an exclusive one night premiere event on Thursday, March 31st at 7:00pm (Local Time). 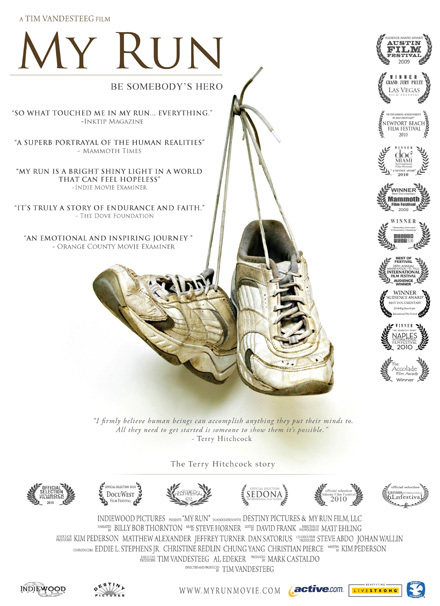 Narrated by Academy Award winner Billy Bob Thornton, MY RUN is the inspirational story of real life superhero Terry Hitchcock, the 57 year old man who ran 75 consecutive marathons in 75 consecutive days. This powerful and uplifting documentary exemplifies a commitment to something greater than yourself and achieving something deemed impossible. “THIS INSPIRING DOCUMENTARY SHOWS US HOW POWERFUL THE HUMAN SPIRIT IS AND HOW AFTER IMMENSE STRUGGLE COMES AN EVEN GREATER ELATION.” Deena Kastor– Olympic Medalist and American Record Holder. I was honored when I was asked to be a part of promoting this film by Mark Castaldo/Award-winning Producer-MY RUN . I love running and I love inspiring stories, marry them together, and you have me on board for sure!!! You know you want to be a part of this!!! Keep in touch with Todayz Run to find out how you can win tickets to see My Run the movie!!! If you are the impatient type, and want to make sure you have secured tickets to this one night event, you can purchase tickets from Fathom Events. (You can also see if a theater near you will be playing this incredible documentary) You can also find out more by following My Run on Facebook! Come on peeps, get out there and live life more, and be somebody’s hero today!!! This entry was posted in Everyday Running, Giveaways, Inspiring, My Run The Movie, Ramblings and tagged Everyday Running, Inspiring, My Run the Movie, Ramblings. Bookmark the permalink. Love a great story. Can’t wait to find out how I can win some tickets to see this film. I have been hearing so many wonderful things about this MY RUN film, so I finally watched the trailer and now I see why, this is an AMAZING story! A group of runners just got our tickets, so we will be there!